We have a new VIP! Zuhause is the German word for home Check out the 5 Dudes Seal! Here are the recent announcements! Some pictures have hidden links. Can you find all of them? Some picture links will take you to external websites, so BEWARE! Hint about picture links: There are only two picture links on the Zuhause page. How To Find 5 Dudes! 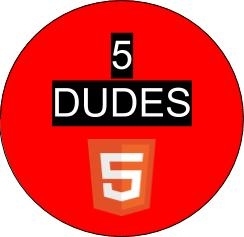 Type in "5 Dudes Google Sites"
Type in Zuhause or something like that. Click the link on the top that says "5 Dudes Zuhause"
Open a file folder for a random website! Keep in mind that most of these files ARE NOT 5 Dudes pages.